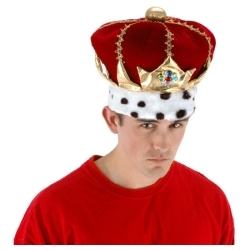 Soft plush red velvet king’s crown with faux white and black fur trim. This crown is perfect for any royal king costumes, Purim costume, as well as for homecoming and prom kings. It also has a fabric lining with a secret pocket containing a fortune. Crown will fit both adults and children with a head measurement of 23.5” by using a Velcro size adjuster.